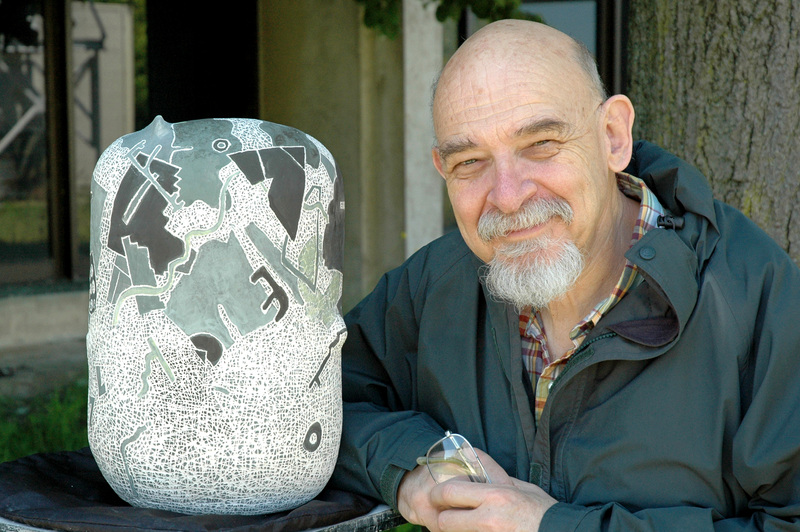 “Last year we lost Richard Zakin, for four decades a professor of ceramics as SUNY Oswego," said Michael Flanagan, Tyler Art Gallery director. "In addition to being an inspired teacher and artist, Richard was a scholar on the technical aspects of ceramics and he authored many books and articles on the subject that benefited artists worldwide." "Faculty Art Exhibition and A Tribute to Richard Zakin" will open with a reception from 5 to 7 p.m. March 8 in Tyler Hall lobby and the adjacent gallery. The reception and exhibition are open to the public for free, though donations are appreciated. The show will run through April 7. Zakin was diagnosed with Alzheimer's disease in 2015. In an effort to give his art meaning and to share his story, he continued to create. Zakin was asked to be a keynote speaker for the Central New York chapter of the Alzheimer’s Association in October 2015 at the start of the organization’s 25th annual Walk to End Alzheimer's. He regularly attended chapter meetings, having found empathy in a community of people with similar circumstances. "Possessing a naturally gregarious personality, he loved to discuss art, music and any of the many topics that interested him,” said Flanagan, who worked closely with Zakin on many of his exhibitions at Tyler Art Gallery. Zakin, who died last April, taught at SUNY Oswego from 1967 until his retirement in 2008. He attended Syracuse University and Brooklyn Museum School, earning a master of fine arts degree in ceramics from Alfred University. Syracuse's Everson Museum has several of his ceramic pieces in its renowned collection, and he exhibited and held workshops extensively, most notably in Honolulu and Chicago. Even after retirement, he continued his strong interest in surface treatment in his ceramic work. Zakin's artwork following his years at SUNY Oswego exhibited a balance of two- and three-dimensional forms, Flanagan said. "Richard's inquisitive nature led him to explore digital drawing late in life, and a selection of these works are included in the exhibit," said Flanagan. "A Tribute to Richard Zakin" takes place with the SUNY Oswego Faculty Art Exhibition, which showcases the recent work -- in a wide variety of media -- of the college's accomplished art faculty. Tyler Art Gallery hours are 10 a.m. to 4 p.m. Tuesdays through Fridays, 10:30 a.m. to 4 p.m. Saturdays and 11 a.m. to 4 p.m. Sundays. It is closed Mondays and during college breaks and holidays. For more information, visit oswego.edu/tyler-art-gallery. For details of other SUNY Oswego fine and performing arts events, visit arts.oswego.edu. Artistic tribute -- SUNY Oswego's Tyler Art Gallery will open the annual Art Faculty Exhibition with a concurrent display, "A Tribute to Richard Zakin," at a reception from 5 to 7 p.m. Friday, March 8. Zakin, who dedicated himself to sharing his journey with Alzheimer's disease following his diagnosis in 2015, was noted for his scholarship and artwork in ceramics during a 40-year career at SUNY Oswego and beyond.